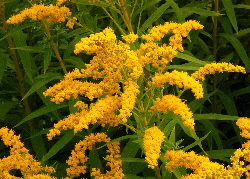 Goldenrod needs little attention and it is easy to propagate from existing plants. Carefully choose the place where you want it to grow, as an established clump can be very hard to dig up and move. Collect the young flowers when they are about to open, for clear bright yellows, as older flowers do not have much dye. Goldenrod produces quite light-fast primrose yellows on wool. Use the flowers soon after picking them, as dried flowers do not produce a good colour. If your flowers are ready and you do not have any mordanted fibres, you can freeze the dye liquor in a well-marked container. Use 50 to 100g of fresh flowers per 100g of mordanted wool. Dean recommends keeping the water just below simmer for an hour for bright yellows. You can sometimes achieve a more intense colour by adding a small amount of soda ash (and therefore increasing the pH) at the end of the dyeing period.